← 24th International Sculpture Conference: Call for Volunteers! Have you registered for the 24th International Sculpture Conference yet? 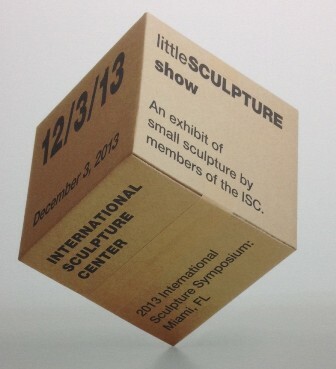 Photo from the littleSCULPTURE show at the 2013 International Sculpture Symposium: Makers & Shapers in Miami, FL. Time is running out to exhibit your artwork at the 24th International Sculpture Conference. The member’s only littleSCULPTURE show is an exhibition of small works by ISC members showcasing how they handle the challenge of space and scale as dictated by the 8″x8″x8″ size restriction. Sign ups close on September 1st, don’t delay, reserve your spot today! Registration for the 24th International Sculpture Conference: Sculpture, Culture, and Community closes on September 15, 2014. Join us from October 1-4, 2014 in New Orleans, Louisiana for four days of exciting tours, panel discussions, keynote speakers Alice Aycock and Fairfax Dorn, ARTSlams, an opening reception at the Ogden Museum of Southern Art, mentor sessions, and more. Find out more at www.sculpture.org/nola2014. Don’t forget to sign up for great optional tours! The 24th International Sculpture Conference will feature a number of exciting art tours in and around the city of New Orleans. See a performance by New Orleans Airlift*, check out the city-wide exhibition of monumental public works on a Sculpture for New Orleans tour*, or take a trip to Terrebonne Parish, Louisiana, 90 miles outside of New Orleans to see the fascinating Kenny Hill’s Sculpture Garden*. To see a full list of all the great optional tours and activities, check out the activities page. Stay an extra day to spend Sunday morning in Tremé*, where you can see a jazz mass at one of the city’s oldest churches, St. Augustine’s Catholic Church, founded in 1842. Afterwords, help celebrate the church’s serendipitous anniversary and join a New Orleans marching band that accompanies Social Aid and Pleasure Clubs followed by brunch at Little Dizzy’s. Get to see what New Orleans is all about! The Renaissance New Orleans Arts Hotel is the official conference hotel, located in the heart of the New Orleans Arts District. Special rates are available now and space is limited, so reserve your room now. The special conference deal is subject to availability. Visit www.sculpture.org/nola2014 for more information. Image | This entry was posted in 24 International Sculpture Conference. Bookmark the permalink. 24th International Sculpture Conference: Call for Volunteers!